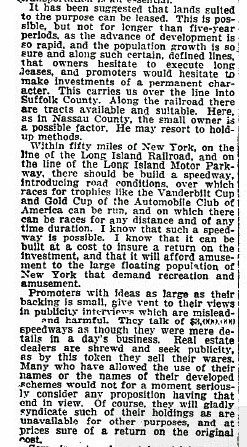 When first planned in 1906, William K. Vanderbilt, Jr. and his business associates always hoped that future Vanderbilt Cup Race courses on Long Island would be designed exclusively on the Motor Parkway without public roads. 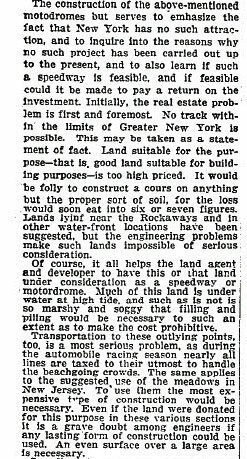 A recently discovered survey shows that in August 1909 a 5.5- mile Motor Parkway speedway loop was designed for the Hempstead Plains (now Levittown). 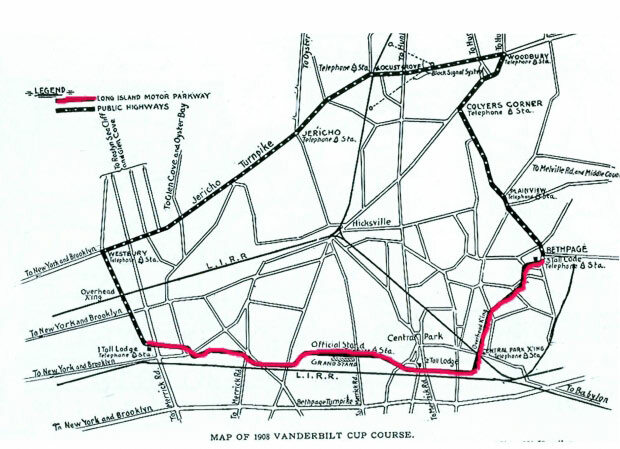 After the 1906 Vanderbilt Cup Race, the AAA demanded that public roads would never be used again for the Vanderbilt Cup Races. 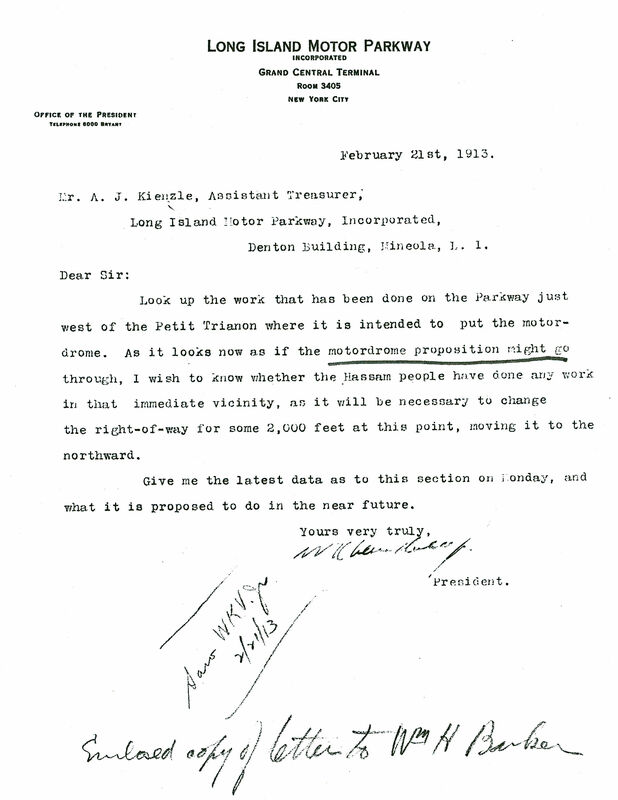 However, only 9 miles of the 1908 course were on the Motor Parkway. The remaining 14.46 miles of the course contined to use public roads. 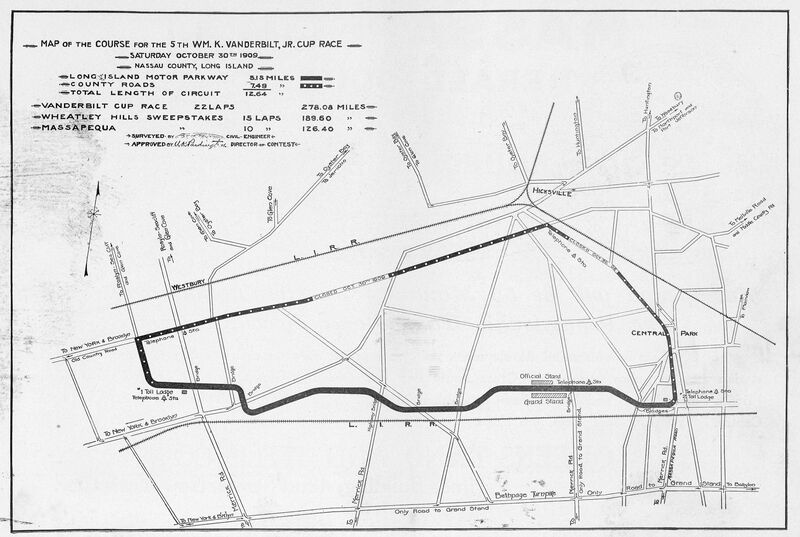 The 1909 and 1910 Vanderbilt Cup Races course used 5.18 miles of the Motor Parkway and 7.49 miles of public roads. 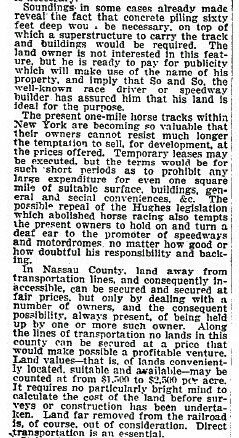 In early 1909, the Long Island Motor Parkway, Inc. examined options in the Hempstead Plains to develop a speedway focusing on properties owned by the Merrillon Estate who were the heirs to entrepreneur Alexander T. Stewart. 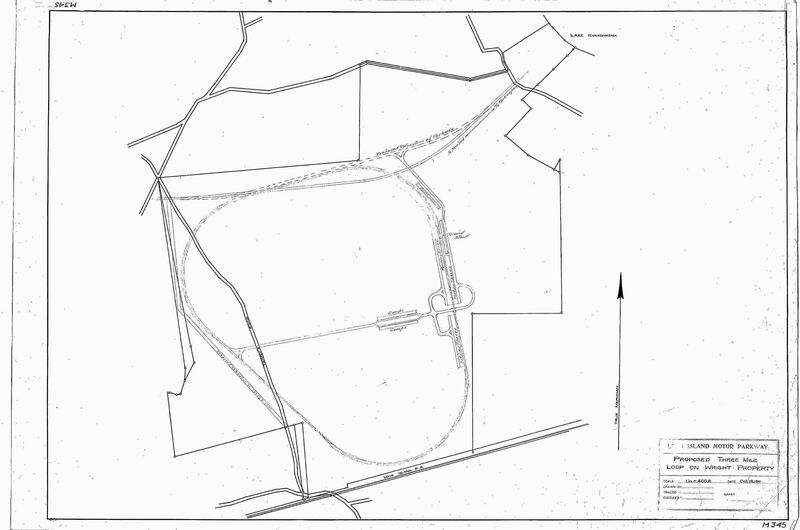 This recently discovered survey indicated the planned 5.5 mile loop for the proposed Hempstead Plains Motor Parkway Speedway. 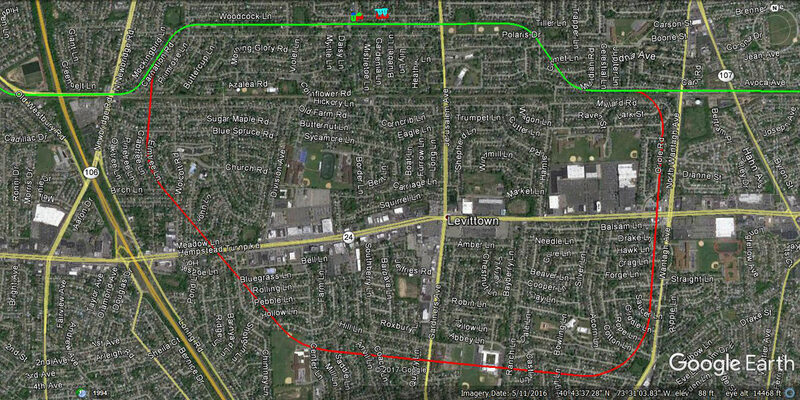 As seen in today's Levittown, the proposed course crossed the LIRR and Hempstead Turnpike twice. Courtesy of Frank Femenias. 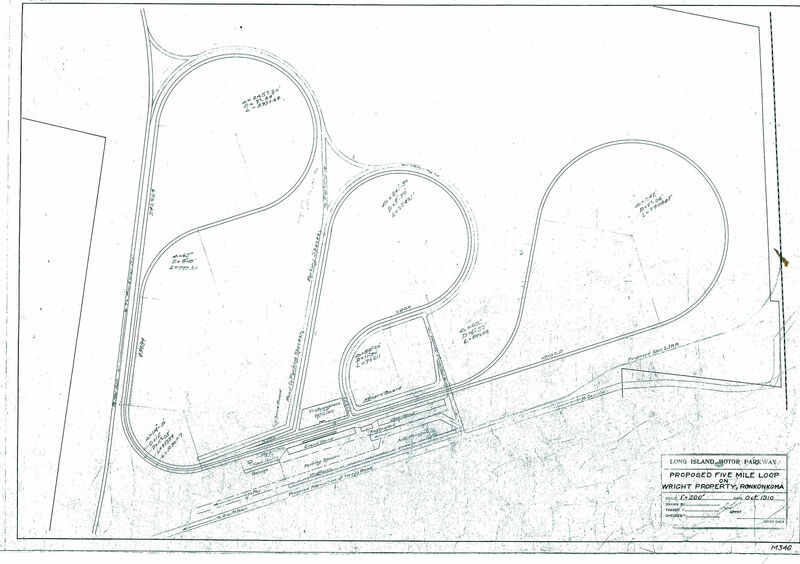 The existing grandstand and press box section of the Motor Parkway was planned to be be part of the 5.5 mile loop. 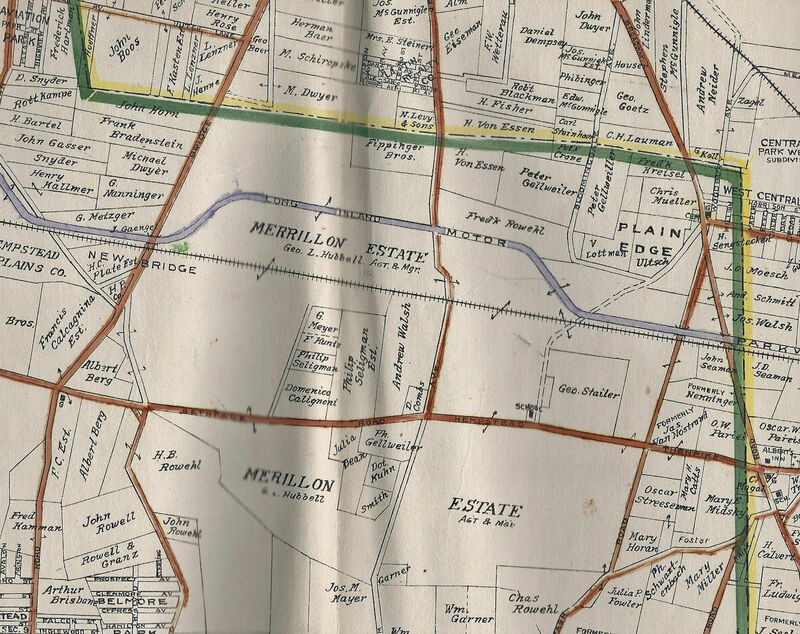 The new sections of the loop shown in the survey were never built. 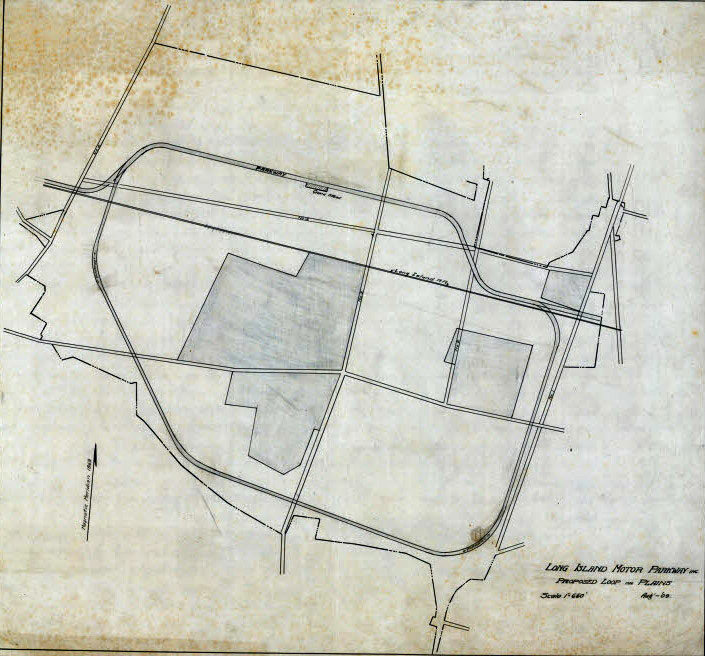 In October 1910, the Long Island Motor Parkway, Inc. tried once again to build the speedway. This time it was planned for the 891.21 acres owned by the Motor Parkway in Ronkonkoma eventually purchased by Walter T. Shirley. A.R. 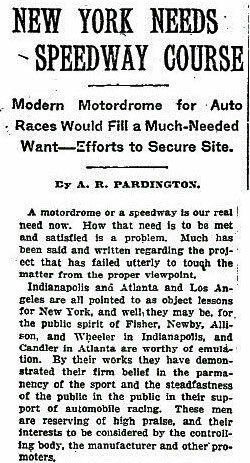 Pardington, general manager and second vice-president of the Motor Parkway, wrote this article describing the need for a "Modern Motodrome for Auto Races." "The real estate problem is first and foremost." "No lands in this county can be secured at a price that would make possible a profitable venture. Land values may be counted at from $1,500 to $2,500 per acre." 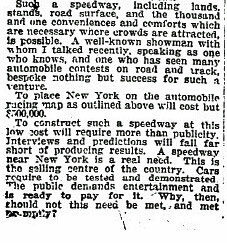 "This speedway would be the Mecca of motordom." "The public demands entertainment and is ready to pay for it. Why, then, should not this need be met?" 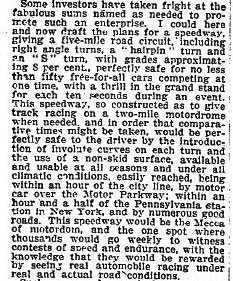 Willie K. tried to revive the concept of a closed loop motor speedway on the Motor Parkway as late as 1913. However, it was never built.